This article originally appeared in Lady Letter, Volume 5, No. 2 and was updated in December 2013. Using consensus process to make decisions can engage all members of your circle, grove, or coven in constructive, creative ways. An alternative to traditional methods such as majority rule, the consensus process is based on a mutual respect for the feelings, knowledge, and opinions of all. The best way to learn consensus is to experience it. This brief article presents some of the nuts and bolts of the consensus process. An excellent manual for consensus is On Conflict and Consensus: A Handbook on Formal Decisonmaking, by C. T. Butler and Amy Rothstein, Food Not Bombs Publishing, 1987. 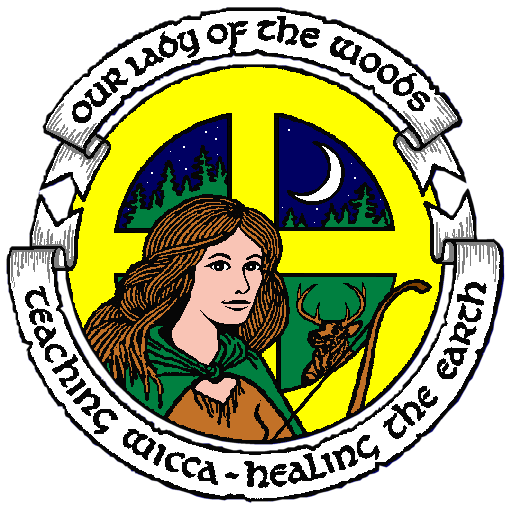 This short and important manual is required reading for all Our Lady of the Woods members. In a consensus circle we are all equal. We have the right to speak and to be heard. During a meeting, all participants should speak and all should listen. A round-robin, where everyone gets a chance, is a good idea. The facilitator (see Roles, below) should gently encourage those who have not spoken to do so and ask those who have spoken frequently to do a little more listening. Some groups use a “talking stick” to indicate who has the floor. The stick passes around the circle or to whoever has their hand up next. In large groups the Sweepstaker (see Roles, below) has the job of keeping track of the next speaker. If it is important to the group, they may put a time limit on the speakers or decide that everyone must have spoken once before anyone gets to speak again. Requiring that everyone speak helps eliminate the disenfranchised minority and keeps the air free of suppressed conflicts that could emerge later as divisiveness and factionalism. In a consensus circle, it is your responsibility to speak out. The group needs to hear from you NOW. During emotionally charged discussions you may have the urge to interrupt. But consensus etiquette says that while someone is speaking, you should be attentive to him or her and avoid interrupting. Wait your turn. Besides, the most important communication tool you have is your ability to listen. Practicing consensus is an excellent way to hone your listening skills. This all ties into another basic: we speak in our own words, for ourselves, freely, without the fear of criticism or attack from others. If you show this respect for others, you can trust that they will show it to you. When speaking, express your own thoughts and feelings; don’t speak for others. As much as possible use “I” statements. This leads to another dynamic pair of assumptions: we are united by a common purpose and we agree to share our power. Wow! Because we have a common purpose, we agree to work in noncoercive ways to reach decisions that benefit the advancement of the common purpose. In other words, we agree to pocket our personal or hidden agendas in favor of group agendas. To this end, the group works hard to come to decisions that all can support. One of the most unique characteristics of consensus is our willingness to share our power. Each person’s honest input is vital, but no one individual has the right to persuade or steer the group in what they think is the RIGHT direction (i.e., their way). Rather, we work from a platform of agreement and build creatively from there. Furthermore, by being open to working through decisions, we commit ourselves to finding new, creative solutions. Blind insistence on personal agendas and remaining closed to the feelings and suggestions of others blocks our ability to find ingenious solutions that can only surface through group process work. What I am speaking of here is nurturing group intelligence. Some ways to grow group intelligence are brainstorming, questioning, engaging in conflict, integrating, and merging ideas. Will conflict arise? Yes. It’s not a bad thing; in fact, it can be a very productive thing. Many of the topics of concern to covens have an emotional charge, and we have strong feelings about them. We’re passionate; we’re unique individuals! We want to be heard not herded! So it’s natural that we will disagree and sometimes lock horns. That’s fine. Here’s some more etiquette: while you disagree, don’t attack others but don’t throw in the towel on the first go around, either. If you don’t find a proposal reasonable, suggest a way to change it so that you can support it. It’s your responsibility to work towards consensus, so remain open to new ideas and offer your own. Part of the bargain of working to consensus is being open to change (that’s something we witches all like, right?). There are ways to object to something, too, and I’ll mention those a bit later. Now stop and try an exercise using the principles outlined above. Choose either scenario: Pick a movie that your group will attend; select the movie, theater, day, and time. Or, order a pizza that you can all eat. 3. Everyone must get something they want. 4. No one should “give in” and just go with the group’s decision. 5. The decision you make as a group should be supported by all. Consensus is not always an appropriate decision-making tool. If you don’t have the first three of these five, you probably won’t be able to make the consensus process work. But most groups engaged in consensus naturally have these three elements; we use them informally a lot, as you did during the movie and pizza exercise. Items 4 and 5 bring the consensus process into a more formal realm, one that small groups may be unfamiliar with. Why is a strong agenda so important? Can’t we just get together and talk things through until we agree unanimously on everything? Isn’t that the point? Well, yes—and no. First of all, a strong agenda supports item 1, the common purpose. The agenda includes items that the group agrees are pertinent. Secondly, the agenda gives structure to the meeting. Topics brought up on the fly are recorded for later consideration This prevents “tangents” that occur and eat up valuable time. Finally, each agenda item is given a certain time limit (determined by the presenter of the item). Our time is incredibly valuable and it is a sign of respect for the participants that the presenters estimate the time they need to cover a topic. Time allotments also give some indication of the relative depth of an item. For example, a 3-minute item is less content-intensive than a 30-minute item. The first thing presented at a consensus meeting is the agenda for review and agreement. The facilitator is a key figure. He or she facilitates the process of the meeting, not the content. An effective facilitator is an astute observer, can synthesize the various statements and proposals being presented, and keeps up with the energy of the discussion. The facilitator keeps the group focused and moving toward consensus. Some of the facilitator’s tools are memory, humor, sensitivity to agreement, diplomacy, objectivity, and general people skills. Many groups function without a formal facilitator and at times this works well. However, for important decisions the group may decide to appoint a facilitator. Group facilitation is a learned skill and an art. When a group has a seasoned facilitator you can almost hear the room hum. Group Attunement: Group attunes through song, breathing, hugs, or similar activity and includes the whole group. Agenda: The prepared agenda is presented for consensus by the group. Presentation: A proposal is presented by its author. Clarifying Questions: Questions are asked of the author as needed. Discussion: Proposal is discussed and debated. Amendments are made. Brainstorming, open discussion, etc. General Poll: Go round-robin, taking a straw poll to see how proposal is fairing. Make a decision to go ahead or discard it. Call for major objections or reservations: Some types of blocks (see below) presented here may stop the proposal (particularly if 100% agreement is needed). Strong reservations do not stop the proposal but are written down by the recorder. Anyone voicing an objection or concern should be willing to explain his or her reasoning and be ready to offer an alternative plan. Check for Consensus: If no major objections are voiced and the general feeling is positive, the facilitator asks if consensus has been reached (“Have we reached consensus that we will meet on alternate Tuesdays at 7:00 p.m.?”). Restatement of agreement: If consensus is reached, the agreement is restated (“We have consensus that we will meet on alternate Tuesdays at 7:00 p.m.”) and a final call for objections is put forth. If none are expressed, a person (often the author of the proposal) is assigned the task of carrying out the work involved (if there is any). It is very important that the facilitator clearly state the decision in steps 8 and 9 and that the recorder properly record it. If consensus is not reached, the proposal may be scrapped, the author may be asked to revise it and present it again at the next meeting, or special groups may be formed to discuss specific concerns. These groups are normally made up of those with strong objections and reservations and the author(s). Process Review: At the conclusion of the meeting, the process observer assigned to this activity briefly critiques the meeting. Here are some methods of agreeing and disagreeing in a formal consensus setting. Often, statements of agreement are kept to a minimum to conserve time. It is generally assumed that if you are silent you agree. During discussion periods if another person makes your point, you are urged not to repeat it unless you have something to add. It’s great to agree; however, if agreement comes too soon on a touchy issue, the decision may be premature and backfire. A good facilitator will be very suspicious of early nodding and twinkling. Twinkling: Consists of some gesture that signifies “yes, I agree; let’s move on.” Some groups call it twinkling. You can establish a unique signal, such as raising both hands in the air and wiggling your fingers (in some consensus settings you need to be willing to look a little silly, I guess.). Here is some more about blocking. If your group has agreed that the proposal being presented will only pass with 100% agreement (see Getting to Yes, below), in that case a block by one person stops the proposal. But this is only the case if you require EVERYONE to say “yes.” Many groups avoid the consensus process because they fear that everyone will be blocking proposals left and right, or that any expression of non-support will stop the proposal. The power of the block or veto strikes fear in many, but it needn’t. There are three alternatives to blocking, as stated above. Before you block, consider if what you really have is a reservation, or if you need to stand aside on an issue. Blocks should be used sparingly. They are warranted especially in cases where the proposal’s enactment would threaten the physical safety of the group or the public, break the law, or oppose the core ethics, morals, policies, and principles of the group. Simple disagreement and conflicts should be worked through to avoid blocking motions. Remember that it is the individual’s responsibility to express concerns and it is the group’s responsibility to address and resolve them. In other words, it is inappropriate for an individual to arrive at a meeting convinced that they will block a proposal without discussion—that sort of behavior is anti-group and anti-consensus. The individual with strong concerns should present them, the group should make an honest effort to address them and provide solutions. It is only after such a focused discussion that the consensus process can be said to have been used. If the group has presented viable solutions that the individual fails to consider or accept, the group may declare that the individual is closed to working toward consensus. In these rare occasions, the group may call the individual out of order and proceed. This protects the group from being hijacked by one individual. Finally, if you find yourself objecting and blocking frequently, you may be in the wrong group. Examine your commitment to the Five (Easy) Pieces of Consensus and act accordingly. Unanimous agreement: Everyone agrees with the decision. Pure consensus: Everyone accepts the decision, even though they may not all agree; they are willing to support it. Working consensus: The decision is accepted by those people who are needed to make it work. Majority decision: More than half agree or are willing to accept the decision (see also Lukewarm). Lukewarm consensus: The proposal is passed with numerous stand-asides or reservations. Our group requires unanimous agreement in some cases but more often settles for pure consensus. Majority decision and lukewarm consensus do not provide as comfortable a feeling. Facilitator: Helps the group move through the agenda. Makes sure that everyone gets to speak. Provides focus. Protects people from attack. Succinctly summarizes throughout the meeting. Frames proposals as necessary and leads the group through the consensus checks. Facilitators do not have an emotional attachment to the topic at hand; if they do, another facilitator steps in. Facilitators do not offer solutions or manipulate the participants to make conclusions or decisions. A good facilitator has a sense of humor, a good memory, is objective, patient, and cares about the group. They facilitate the process, not the content. Recorder (Notetaker, Scribe): Records key points of discussions, decisions reached, things needing to be addressed later, and who is assigned to what task. Reminds people of information recorded as needed. May take notes in a tablet or on large sheets of newsprint that can be displayed. Works closely with the facilitator to provide focus. Timekeeper: Keeps track of time per the agenda. Notifies participants when halfway points for an item are reached. If an item seems to be going over its allotted time, asks the group if they want to contract more time. Also asks the group if they want time limits kept on brainstorming sessions, individuals during round-robins, etc. Sweepstaker: Keeps track of the order in which people will speak. If not, this job is done by the facilitator. Process Observer: Observes how the process works; conducts a post-meeting evaluation and identifies what went well and what did not. This term also applies to persons who may interrupt the meeting at any point to identify a violation of process. When they raise their hands, they should also say “POINT OF PROCESS” so that the facilitator will let them have the floor immediately. 1. Listen (the single most effective communication tool). 5. Don’t repeat what others say if you agree with it, only if you have something to add. 6. Do not block without extremely important reasons (moral, safety, or ethical violations that threaten the group). 7. Look after your needs and express your feelings. 8. Be able to explain yourself (“I think this might be a good thing because…”). 10. It’s OK to disagree.